Diabetes and Endocrine Center of Florida (Orlando) - Book Appointment Online! ** Please give the office 48 hours notice before any cancellations, thank you** Diabetes and Endocrine Center of Florida has a philosophy based on the understanding that every disease has a cause. Finding the cause is at utmost importance to us and we do so to insure a better quality of life for our patients. We understand that each patient is unique and we strive to create the best treatment plan for each individual. Our goal is to create an atmosphere where patients can feel secure and comfortable that their concerns and needs are taken care of in a professional and genuine manner. We do our best to distinguish ourselves through kindness, care, and professionalism. Dr. Zikra focuses in every visit on what can be altered and adjusted to improve your quality of health. She works together with you in order to make a difference in your disease management. No pressure from the Dr, but great advice. My concern as well as for my family. 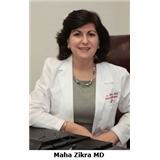 I would recommend Dr. Zikra.